The Kia Sorento had a credibility problem. It was perceived as just an average SUV that did what average SUVs do and little else. Yes, it could cope with on-road but what about off? The only way to answer this was to take it to one of the highest and most challenging off-road trails in the country. 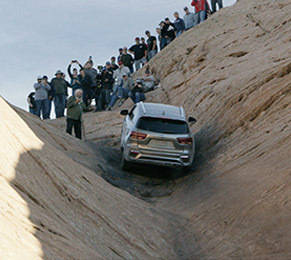 This 2-minute online film (accompanied by a 30-second cut-down TV version) presents the very real drama of how the Sorento set out to reach the top of the treacherous Hell’s Gate in Moab, a destination normally reserved for high-end, professionally spec’d 4x4s. By conquering a real mountain, we also conquered a prejudice or two and at the same time inspired the Conquer Your Mountain campaign that grew from it and helped us launch the 2019 Kia Sorento, which kicked off in June 2018.